Emphysema is defined as a pathologic presence of gas or air in the soft tissues. In the head and neck area, it rarely occurs during or after dental treatment, which is usually related to endodontics. In case of subcutaneous air in the cervicofacial tissue and/or the mediastinal region, it can be life threatening for patients. The current case reports an iatrogenic cervicofacial and mediastinal SCE after endodontic retreatment of a maxillary canine with the usage of a rubber dam. To the best of our knowledge this is the second reported case in the literature of an SCE caused by endodontic therapy upon using a rubber dam. 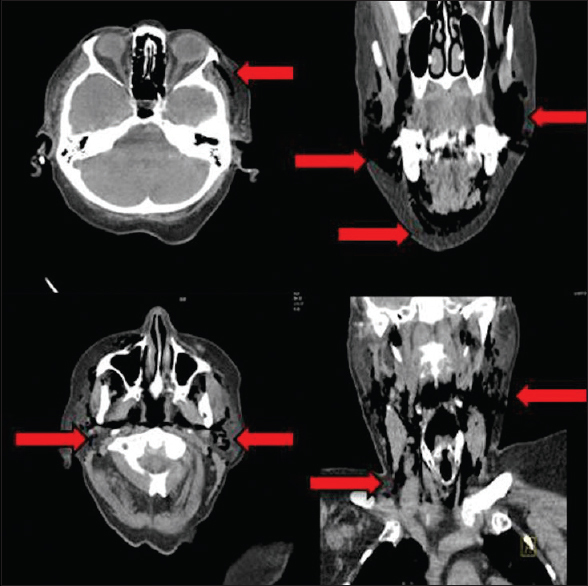 A 79-year-old woman was referred to the dental emergency department with a rapidly onset swelling at the right side of her cheek, face, and neck. Moreover, she reported of a throat tightness, impaired breathing, and odynophagia that became worse during the day. Her symptoms began earlier that day during the endodontic retreatment of the right maxillary canine at her dentist. The dentist reported that the swelling suddenly began while an air syringe [Figure 1] was used to dry the access preparation (after removing a fiberglass point). The usage of a rubber dam was confirmed. The treatment was finally completed with definitive gutta-percha filling [Figure 1] and [Figure 2]. The clinical examination showed an obvious swelling with crepitation upon palpation of the right buccal, submandibular, and neck region [Figure 3]. The Hamman's sign (mediastinal crepitation over systolic heart contraction), an important sign in the diagnosis of a mediastinal emphysema, was negative. The examination of the soft tissues in the region of the right canine revealed no swelling [Figure 2]. The medical history additionally revealed a diabetes type II, an arterial hypertension, bronchial asthma, and a cataract. She denied smoking or alcohol abuse. The blood values during initial presentation were C-reactive protein (CRP) 5.0 mg/dl, leukocytes 13 × 10−3/μl, and blood glucose level 178 mg/dl. She showed minimal dyspnea signs. 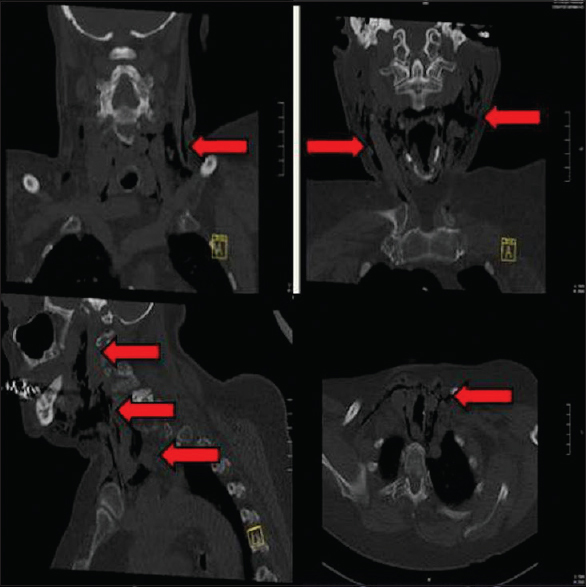 The computed tomography (CT) of the head and neck revealed one extended submandibular cervicofacial and mediastinal emphysema on both sides [Figure 4] and [Figure 5]. There were no pathological lymph nodes on both sides of the neck and thorax, however, there were few degenerative changes of the spine. After consultation in the thoracic surgery department, the patient was hospitalized for medical monitoring. The thoracic surgeons did not recommend any therapy in their discipline. Cefuroxim 1.5 g (Ratiopharm GmbH, Ulm, Germany) was administered intravenously three times a day, and analgesics (Ibuprofen 600mg, Hexal AG, Bonn, Germany) were given orally when needed. On the second day, an ultrasonic examination was performed as follow-up imaging. The emphysema was still present at the cervicofacial and submandibular regions on both sides. Further, the swelling and crepitation upon palpation was obvious. The patient reported of an attenuation of the dyspnea and odynophagia. She denied any headache or chest pain. The follow-up ultrasonic examination on the 4th day of the hospitalization showed a reduction of the SCE [Figure 6]. The patient was discharged from the hospital on the 5th day without any clinical symptoms. At the follow-up examination after 2 weeks there were no further signs and symptoms of the emphysema. Emphysema can be characterized by a pathologic accumulation of gas or air in the soft tissues. They can occur spontaneously following nose sneezing, after dental surgery (removal of impacted teeth), or can be iatrogenic. The first who reported of a spontaneous emphysema after dental treatment in the literature was a physician. A bugle player felt a sudden onset swelling in his face while playing his instrument immediately after a tooth extraction. SCEs mostly occur in the context of removal of impacted teeth, endodontic treatments, and periodontal surgery. SCEs caused by endodontics are mostly due to compressed air beyond the apex, i.e., by a hand turbine used for access preparation and/or root canal irrigations. Moreover, the absence of a rubber dam can play an important role in the formation of the SCE due to the fact that the air can also penetrate through the gingival sulcus. Recent publications only report SCE cases in the context of an endodontic treatment without using a rubber dam., In these cases, it stays questionable whether the SCE occurred due to the air penetrating the periodontium or the root canal system beyond the apex. To the best of our knowledge, this is the second reported case of cervicofacial mediastinal SCE upon using a rubber dam after Al-Qudah et al. in 2013. We hypothesize that the rubber dam avoided air penetration through the gingival sulcus and that the compressed air could have solely found its way through the root canal system into the surrounding tissues. It is known from the literature that excessive air drying of the root canal system instead of using paper points can favor the formation of an SCE. Especially in cases with pathological periapical lesions such as cysts or granuloma, it is hypothesized that there is less resistance to compressed air. This consequently increases the risk of air expansion into the adjacent soft tissues or even further into the loges of the head and neck region. The following clinical symptoms are sudden onset of a swelling, severe pain, and crepitation upon palpation of the surrounding soft tissues. The threats of SCEs are determined by their extension and area of dispersion. A subcutaneous orbital emphysema is close to the cavernous sinus and can consequently lead to a severe infection or embolus. This can cause an ischemia of the optic nerve or its compression, which can lead to a sudden blindness. This case reports of an extensive cervicofacial and mediastinal subcutaneous emphysema after endodontic retreatment of an upper canine. Most of the reported SCEs are associated with irrigation solutions such as hydrogen peroxide., It can pass the apex by either high pressure or excessive irrigation. If it passes through the apex, it dissolves spontaneously into oxygen and water. Further influencing factors are an incorrect working length and iatrogenic or pathologic lateral and/or apical perforations. Because of this well-known fact and the high risk of the development of an SCE, hydrogen peroxide is not used as the main irrigation solution anymore.,, It has been replaced by sodium hypochlorite. This irrigate agent has the ability to dissolve organic tissue and to remove the smear layer, which implies the destruction of the biofilm within the canal and dentine tubules. The antimicrobial effect consists of an irreversible enzymatic inhibitory effect of the bacterial metabolism by replacing oxygen with chloride. In our case, the dentist used sodium hypochlorite as irrigation (approximately 5–10 ml). He also reported that he used a special thin air syringe system to dry the open root canal system. According to the statement of the dentist and the evidence in the literature, we assume that the SCE was solely caused by the air syringe system. In addition, the dentist reported of a lateral perforation that was visible after removing the glassfiber point, which probably favored the penetration of air in the surrounding tissues. The air might have entered the tissues upon the apex, as well as penetrated through the perforation and was channeled into the soft facial tissues and further into cervical spaces. The patient also experienced a sudden onset of severe pain and swelling while being treated. In cases related to sodium hypochlorite incidents, patients described a burning sensation, paresthesia, and ecchymosis. These symptoms could not be found in our case. In addition, such symptoms might lead to an interruption of the endodontic treatment. The correct clinical diagnosis with the help of available imaging methods can help to exclude differential diagnoses such as angioedema, anaphylaxis, or hematoma.,, A CT scan is the best way to diagnose the emphysema. Moreover, an SCE can be distinguished from gases caused by a necrotizing fasciitis. Without the clinical sign of crepitation, palpation of the surrounding soft tissues can result in complications such as an anaphylaxis. If the emphysema is confirmed, a systemic antibiotic chemotherapy should be administered intravenously  and oxygen supply should be given if needed. Daily clinical controls are recommended to ensure a rapid response to changing symptoms or findings. In our case, the patient had a decrease in clinical symptoms. Therefore, an additional CT scan was avoided and ultrasonic examinations were considered to be adequate. This decision was also made in order to reduce the radiation exposure. During endodontic treatment preventive measures should be taken into account to avoid such complications. A high-speed hand air turbine is not recommended. The use of a rubber dam can be helpful to isolate the tooth and cover the gingival sulcus as an entrance point for compressed air. The root canal should not be dried with an air syringe but with paper points or cotton pellets. Avoiding the use of a hydrogen peroxide as the main irrigant can additionally be helpful to prevent an SCE. The irrigation solution should not be applied with high pressure. In case of the occurrence of an SCE, early detection and management can be crucial for the patient. Although the experienced swelling and symptoms after dental treatment are moderate, the use of an antibiotic chemotherapy and the referral to the oral and maxillofacial surgery department is recommended, where the right diagnostics and treatment can be performed. This includes a CT scan and a clinical examination. It must be considered that expanded SCEs into further spaces and loges can become life threatening for the patient. The risk of an additional infection upon the SCE should be reduced by the intravenous administration of antibiotics. In our case, the treatment with intravenous antibiotic chemotherapy led to a fast decrease of the SCE. A follow-up CT scan was, therefore, not indicated. Instead, ultrasonic examinations were performed. In conclusion, early detection and the right diagnosis of an SCE are crucial for the patient to prevent further complications, which can become life threatening. General dentists and/or endodontists should prevent the occurrence of SCEs by performing adequate drying and irrigation procedures while treating the root canal system. The usage of a rubber dam may avoid the penetration of compressed air through the gingival sulcus. Heyman SN, Fuchs S, Brezis M. The role of medullary ischemia in acute renal failure. New Horiz 1995;3:597-607. Davies DE. Pneumomediastinum after dental surgery. Anaesth Intensive Care 2001;29:638-41. Josephson GD, Wambach BA, Noordzji JP. Subcutaneous cervicofacial and mediastinal emphysema after dental instrumentation. Otolaryngol Head Neck Surg 2001;124:170-1. Yang SC, Chiu TH, Lin TJ, Chan HM. Subcutaneous emphysema and pneumomediastinum secondary to dental extraction: A case report and literature review. Kaohsiung J Med Sci 2006;22:641-5. Al-Qudah A, Amin F, Hassona Y. Periorbital emphysema during endodontic retreatment of an upper central incisor: A case report. Br Dent J 2013;215:459-61. Hamman L. Spontaneous mediastinal emphysema. Bull Johns Hopkins Hosp 1939;64:1-21. Turnbull AD. A remarkable coincidence in dental surgery. Br Med J 1900;1:1131. McKenzie WS, Rosenberg M. Iatrogenic subcutaneous emphysema of dental and surgical origin: A literature review. J Oral Maxillofac Surg 2009;67:1265-8. Kim Y, Kim MR, Kim SJ. 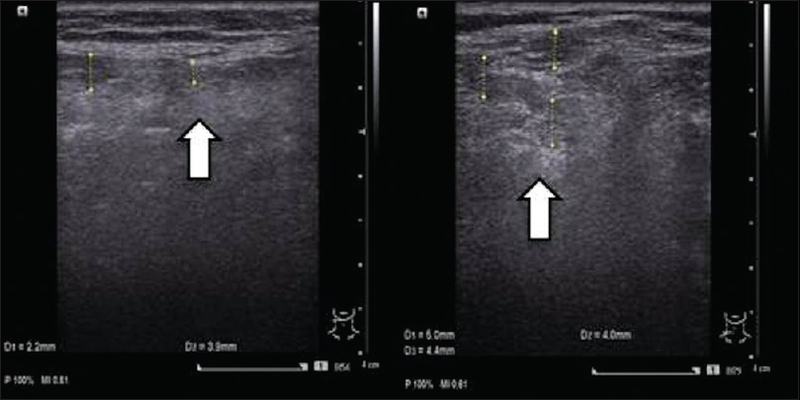 Iatrogenic pneumomediastinum with extensive subcutaneous emphysema after endodontic treatment: Report of 2 cases. Oral Surg Oral Med Oral Pathol Oral Radiol Endod 2010;109:114-9. Durukan P, Salt O, Ozkan S, Durukan B, Kavalci C. Cervicofacial emphysema and pneumomediastinum after a high-speed air drill endodontic treatment procedure. Am J Emerg Med 2012;30:2093-6. Mishra L, Patnaik S, Patro S, Debnath N, Mishra S. Iatrogenic subcutaneous emphysema of endodontic origin - Case report with literature review. J Clin Diagn Res 2014;8:279-81. Ali A, Cunliffe DR, Watt-Smith SR. Surgical emphysema and pneumomediastinum complicating dental extraction. Br Dent J 2000;1888:589-90. Kuno R, Robertson WD. Cavernous sinus air following orbital trauma. AJR Am J Roentgenol 1995;164:980. Rubinstein A, Riddell CE, Akram I, Ahmado A, Benjamin L. Orbital emphysema leading to blindness following routine functional endoscopic sinus surgery. Arch Ophthalmol 2005;123:1452. Samuels TL. Rare complications of surgical emphysema and pneumomediastinum occurring post dental extraction. Postgrad Med J 2009;85:404. Steiner M, Grau MJ, Wilson DL, Snow NJ. Odontogenic infection leading to cervical emphysema and fatal mediastinitis. J Oral Maxillofac Surg 1982;40:600-4. Magni G, Imperiale C, Rosa G, Favaro R. Nonfatal cerebral air embolism after dental surgery. Anesth Analg 2008;106:249-51. Battrum DE, Gutmann JL. Implications, prevention and management of subcutaneous emphysema during endodontic treatment. Endod Dent Traumatol 1995;11:109-14. Rickles NH, Joshi BA. A Possible Case in a Human and an Investigation in Dogs of Death from Air Embolism during Root Canal Therapy. J Am Dent Assoc 1963;67:397-404. An GK, Zats B, Kunin M. Orbital, mediastinal, and cervicofacial subcutaneous emphysema after endodontic retreatment of a mandibular premolar: A case report. J Endod 2014;40:880-3. Coulier J, Deprez FC. Iatrogenic facial subcutaneous emphysema after endodontic treatment. JBR-BTR 2011;94:38. Nahlieli O, Neder A. Iatrogenic pneumomediastinum after endodontic therapy. Oral Surg Oral Med Oral Pathol 1991;71:618-9. Mehdipour O, Kleier DJ, Averbach RE. Anatomy of sodium hypochlorite accidents. Compend Contin Educ Dent 2007;28:544-6. Varise TG, Estrela C, Guedes DF, Sousa-Neto MD, Pecora JD. Detection of organochlorine compounds formed during the contact of sodium hypochlorite with dentin and dental pulp. Braz Dent J 2014;25:109-16. 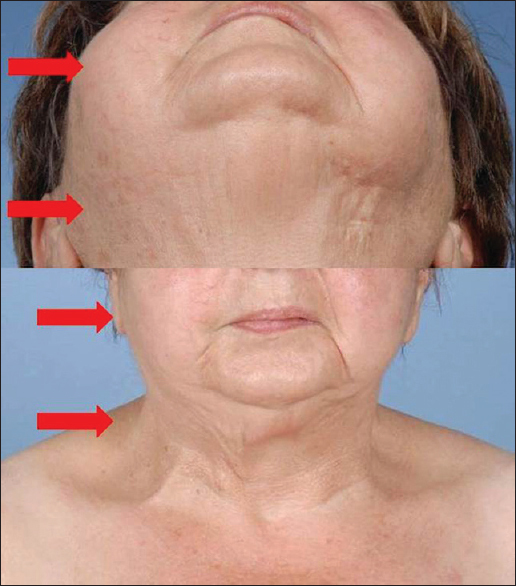 Pereira KF, de Souza Mello ML, Arashiro FN, Estrela C. Application of low-level laser as auxiliary therapeutic of swelling areas caused by apical accidental extrusion of sodium hypochlorite: Case report. Revista Odontol Brasil Cent 2015;23. Estrela C, Estrela CR, Barbin EL, Spano JC, Marchesan MA, Pecora JD. Mechanism of action of sodium hypochlorite. Braz Dent J 2002;13:113-7. Kishor N. Oral tissue complications during endodontic irrigation: Literature review. N Y State Dent J 2013;79:37-42. Spencer HR, Ike V, Brennan PA. Review: The use of sodium hypochlorite in endodontics-Potential complications and their management. Br Dent J 2007;202:555-9. Fruhauf J, Weinke R, Pilger U, Kerl H, Mullegger RR. Soft tissue cervicofacial emphysema after dental treatment: Report of 2 cases with emphasis on the differential diagnosis of angioedema. Arch Dermatol 2005;141:1437-40. Salib RJ, Valentine P, Akhtar S. Surgical emphysema following dental treatment. J Laryngol Otol 1999;113:756-8. Karras SC, Sexton JJ. Cervicofacial and mediastinal emphysema as the result of a dental procedure. J Emerg Med 1996;14:9-13. Wakoh M, Saitou C, Kitagawa H, Suga K, Ushioda T, Kuroyanagi K. Computed tomography of emphysema following tooth extraction. Dentomaxillofac Radiol 2000;29:201-8. Reznick JB, Ardary WC. Cervicofacial subcutaneous air emphysema after dental extraction. J Am Dent Assoc 1990;120:417-9.